It was Veteran's Day weekend and just another magical, crazy night on Hollywood Boulevard where Elvis poses for pictures, stars' names pave the sidewalk, and sometimes the magic is not just special effects. Rock singer Alexandra Starlight and her finance, guitar player Zachary James, were performing a rare acoustic set at The Hard Rock Café to entertain guests of the American Film Institute Fest before the World Premiere of Out of the Furnace, (starring Christian Bale, Casey Affleck, Zoe Saldana and Woody Harrelson) drew limos and fans to the red carpet at the theater next door. Alexandra's parents, Zachary's mom, the band's favorite photographer Billy Bennight, and band groupies sat in the front row in front of the Hard Rock stage waiting for the performance to begin when Hard Rock employees asked them to move from the table as it had been reserved for a party of 16 and they were entering the building. The group of 15 women and one man entered and sat down at the best table in the house. Alexandra, exotic with long turquoise hair, dressed in a glittering cape and platform shoes, took the stage with Zachary, a model perfect Joey Ramone who has his own band and has toured the country with several Hip Hop artists including Liil' Wayne. Alexandra noticed the table up front right away. "They were a very generous crowd. We connected from the first song. The conversation started when I asked them what they were drinking-- Pink Lady Margaritas! After a few songs, one of the ladies gave me a yellow rose, which Zach put in his guitar. We dedicated our song, "I'll Stand By You," an original by Zach and me, to the group. Towards the end, I noticed they were singing along with me, and it sounded insanely great! It was surprising that such a large group, all singers, happened to be in the front! Anyway, when I heard the song being sung so beautifully by a group with such positive energy, I had to drag them on stage with me so everyone could hear." Alexandra invited the whole group on stage and they sang like the best choir in the land, maybe because they are. 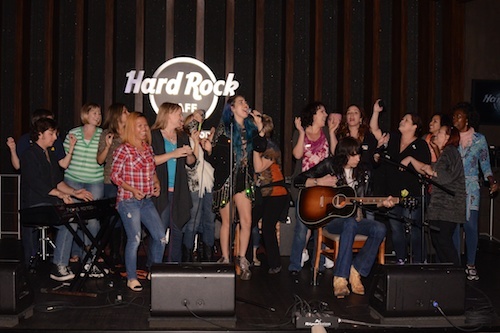 By chance or Hollywood magic, the front table at the Hard Rock was seated with the American Military Spouses Choir -- a group put together through auditions throughout the nation conducted by the nonprofit CAMMO, the Center for American Military Music Opportunities, a nonprofit "providing quality music therapy services to restore, maintain, and improve the physical, emotional, psychological, and neurologic functioning of wounded active-duty service members and veterans through the systematic use of music." The choir, who had already appeared on America's Got Talent and at The Kennedy Center among other command performances, were in town to film several TV appearances including The Queen Latifah Show, The Hallmark Channel, and a Veteran's Day special. Chorister Stephanie Holmberg, who is stationed at Fort Leavenworth, Kansas said of the Hard Rock experience "It was spontaneous, energetic and electrifying!" Erin Whitehead from Fort Huachuca, Arizona added, " How fun to be able to share in such a cool moment with my Military Spouse brothers and sisters!" What happened on stage that Saturday night in Hollywood, captured by photographer Billy Bennight and Alexandra's dad Rino Lee, on home video, was a spontaneous and brilliant burst of fireworks just in time for Veteran's Day. Watch Alexandra and the American Military Spouses Choir here. Click here for more info on CAMMO and AMSC. And hear more about Alexandra and the Starlight Band.